Mallorca has some fabulous beaches, over the years we have been staying in and around Pollensa we have found, what we think are some gems – some are quiet and a bit of a drive to get to, others very easily accessed. If you have any particular favourites you want to share write a review and send it to beaches@theabsolutelygroup.com - we’ll sample them ourselves before sharing the information!! Remember to take sun tan lotion, water perhaps an umbrella for shade, buckets and spades for the kids (and Dad) and a good book! Over the years we have been visiting these beaches we have found them to be quiet until around mid-day to 1pm – so the trick is to get there early! Formentor is a beautiful stretch of beach about a 15 minute drive from Puerto Pollensa along the 2210 road which winds its way out to the Cap de Formentor. The car park costs 8€, but if you get there early there is plenty of parking along the roadside. Alternatively the beach is served by a number of Ferries that leave Puerto Pollensa at 11am, arriving at the beach at mid-day. There are two beaches split by the landing stage and restaurant. The right hand side as you look out to sea is always quieter. If you arrive early you virtually have the beach to yourself all morning. Good sandy beach with gentler shelving seabed for shallow swimming. Perfect for families. Café, sun loungers, pedalos, umbrellas available for hire. Not one for the kids as we found out last summer. Park in the car park just before the tunnel on the road to Cap de Formentor – about 5 minutes after the Formentor Beach car park. 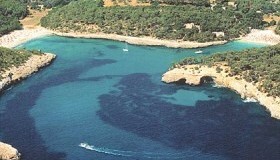 Realistically the cove is a 45 minute walk down through olive groves past a donkey sanctuary. It’s a truly beautiful bay, but no sand. 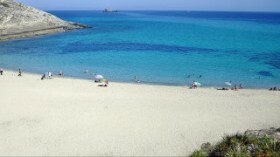 Great swimming and snorkeling, very quiet with grassy bank for sun bathing. The bay does fill up with boats as the day draws on. Park in the same car park as for Carla Murta, but follow the path north which descends steeply down to the beach – shingle, again not great for the kids, but wonderfully quiet and excellent for swimming. A small pebbly cove with wonderful swimming – but it is a walk from Puerto Pollensa through the Boquer Valley – also known as the pine walk. Around 2 kms, but the last 500m the path drops quite steeply down to the beach – remember to save some water for the walk home. Very quiet but the bay can fill up with boats. A great swath of sand stretching from the Marina right down to Alcudia. The best ‘sand’ is around Puerto Pollensa, but it does get busy. Do what the locals do and spend a relaxing evening soaking up the last of the day’s sun on an empty beach! Gently shelving seabed perfect for children swimming, lots of trampolines, cafes, sunbeds, pedalos, boats for hire. 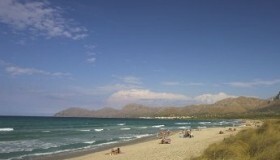 As you move further down the beach towards Alcudia the beach does become a little windswept and a lot quieter. This is the home of kite surfing and windsurfing in Pollensa and there are a number of schools that will introduce the thrills of kite or windsurfing to you or simply just hire the equipment to you. El Baracares is a very popular locals beach just north of Alcudia – follow the road along the Bay of Pollensa turn left just after the bay ends and before the Alcudia roundabout. Follow your nose keeping as close to the coast as you can – 600m – you can’t miss it. 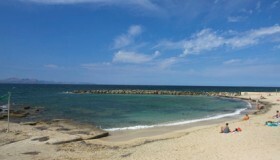 It’s a small but welcoming beach – just 100m wide but sandy and excellent swimming. In the Mal Pas area of Alcudia – a little tricky to find – by a decent large scale Map (We have found the Mallorca North and Mountains 1:40000 excellent! ), free parking above the beach – remember to leave your car in gear with the hand brake on! 50m path down on to the sandy beach. To the right is a small café with sun loungers and umbrellas for hire. Sandy beach with an anomaly – there is a stretch of pebbles and stones about 5 yards wide as you go into the sea – to avoid the stones go right to the left hand side where a thin stretch of sand goes right into the sea. Good swimming but can get a little wavy. Very quiet in the morning. Again in the Mal Pas area of Alcudia and just before Playa de sa Font de Sant Joan – as you drive in you’ll notice the road leading down to the beach. 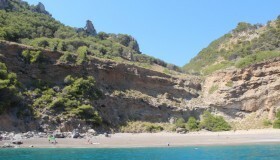 A popular sandy cove with a café, sun loungers and umbrellas. Some boats are moored here as well. 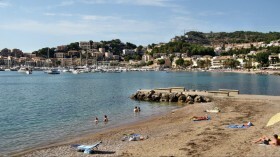 The beach does get busy but Playa de sa Font de Sant Joan is just a 10 minute walk away. A great day out for the whole family (especially Dads and Granddads!) Take the old train from Palma into Soller, then the tram from Soller to the Port – a real nostalgic railway day! 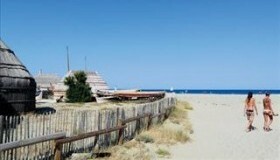 The beach is wide and does get busy but there always seems plenty of room, lots of bars, cafes and so on. Sandy good swimming in and out of moored boats – though they have boat free swimming areas. Then the tram and train back at the end of the day! Drive through Alcudia on the MA12 heading for Arta. Turn left to Son Serra de Marna, then right and park as far along as you can. A beautiful stretch of beach with fabulous mountain views. Great sand but it can get a little wavy so not good for timid swimmers. A beautiful un-spoilt beach well away from anywhere! From Alcudia drive to Mal Pas – bare right in Mal Pas and follow signs for ‘Parc de la Victoria’. The beach is a 3km walk from where you park your car. Alternatively hire a boat and anchor just off the beach! Drive through Arta on the MA15 but turn off just before the petrol station as you leave Arta. Follow the road through the mountains – it turns to gravel. Bare right to Carla Torte (there are 2 other beaches further on Carla Mitjana which is supposed to be beautiful but we have never quite made it there!) large car park, small café, never gets busy, good sandy beach with excellent sheltered swimming. But beware it is popular (we say popular loosely as it never seems to get busy) with naked German and Dutch holiday makers. 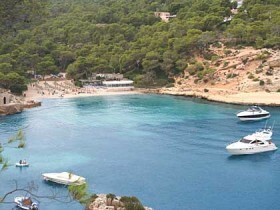 Cala Mondrago features in many a tourist brochure of Mallorca. 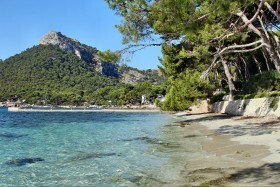 It is a stunning beach just outside Satanyi – around 45 minutes to an hours drive from Pollensa on the south east coast. It is well worth the drive. The car park is free and the beach is around a 10 minute walk down the cart track. There is a small café, sun loungers and umbrellas available for hire. Pedalos are also available. We’d suggest an early start to make the most of the beach before it fills up.